Contents Includes 1 sign holder comprised of 2 black sign uprights (one with wheels), 3 black cross tubes, and 1 set of assembly hardware. 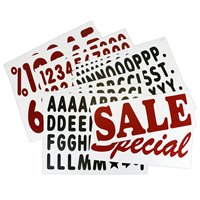 The DELUXE version comes with two - 28" x 44" x 4mm white sign faces with 6 letter tracks on one side of each, one set of 289 - 5" letters, numbers and symbols (black letters & red numbers), two - giant 10" double-sided headers (Sale/Special in red), and one set of 24 - giant 10" numbers with the percent symbol (red). 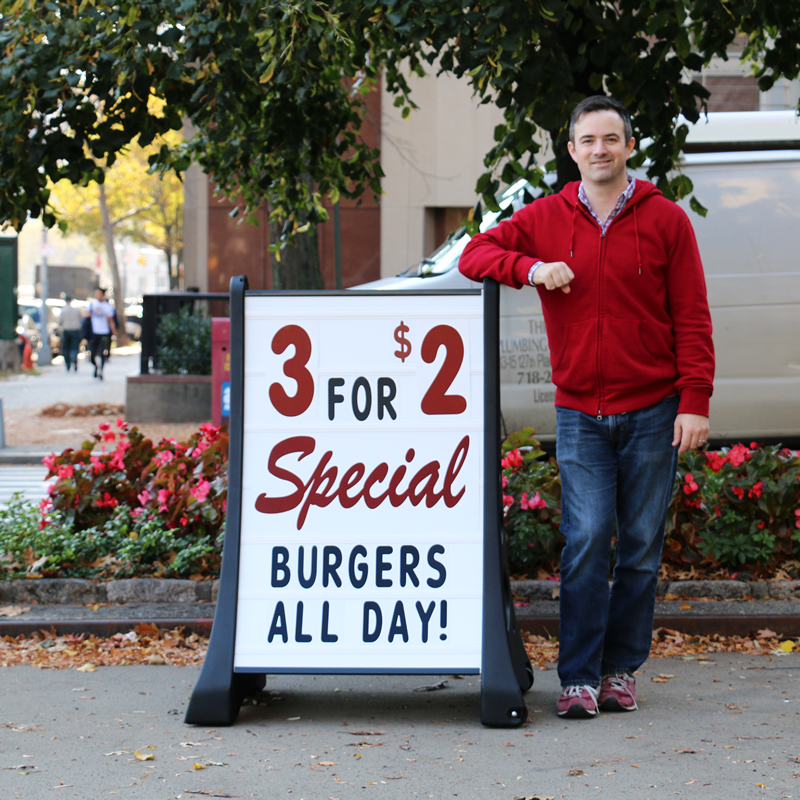 The best sidewalk sign just got bigger! 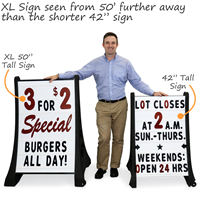 With 50% larger sign face that maximizes visibility at greater distances and allows you to create longer or multiple advertisements with more details, the XL-QLA Sidewalk Sign is sure to make an impact! 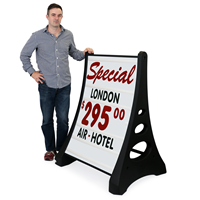 • Comes with a customizable message board allowing you to create a plethora of advertisements, messages or sales pitches. 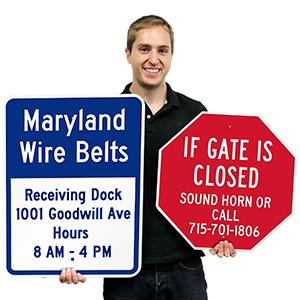 • Four anti-slip rubber feet (on the bottom of the uprights) keep the sign firmly in place when on the sidewalk to prevent shifting and dislocation due to gusts. • The EZ Lock feature offers security by deterring unauthorized individuals from pulling out or tampering with the message board. • Alcoved 3" wheels making moving the XL-QLA a breeze. Recessed wheels sit above the ground and engage when the unit is tipped. 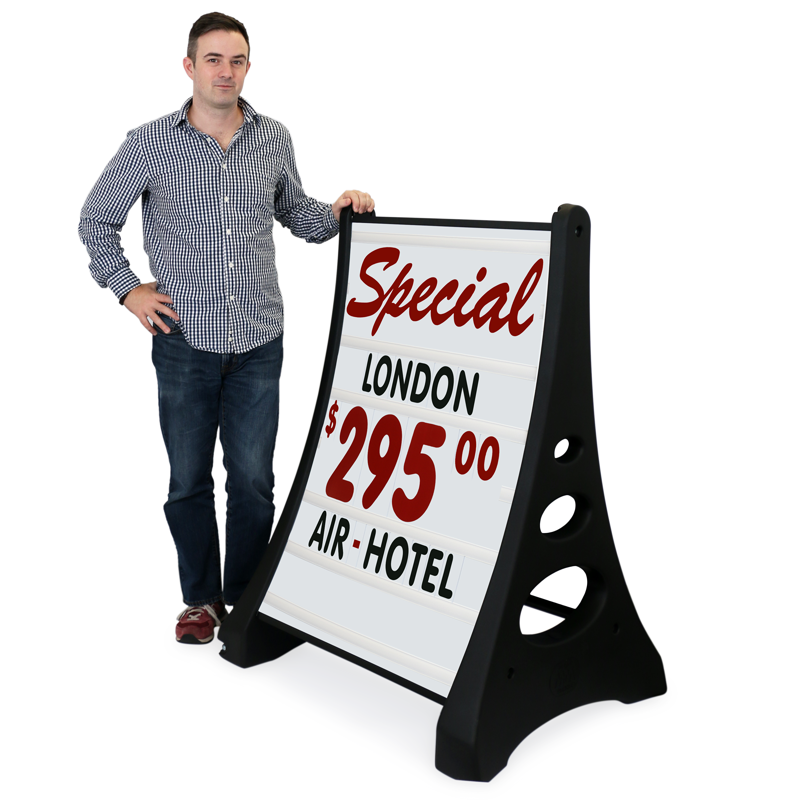 • Curved sign face deflects winds of up to 30+ mph. For added stability in windy conditions fill both of the 1.5 gallon capacity ballast ports (located at the base of each upright) with water or sand for an extra 3 gallons of weight/mass. 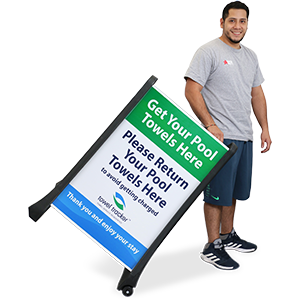 • XL-QLA™ A-Frame Sidewalk Sign Holders are made from rustproof plastic technopolymers to withstand harsh environments. Whether its snow, rain, sleet, or the baking heat of summer these practical holders won't fracture, break or degrade. • The A-Frame legs feature curved channels that are designed to fit any 28" (w) x 44" - 48" (h) material with a thickness of 4mm (3/16"). This contour allows any inserted sign component to deflect winds of up to 30+ mph. • For additional support and stability in windy conditions, the A-Frame legs have a built-in ballast port that is able to accept water or sand. Each ballast is able to hold approximately 1.5 gallons of water for a total of 3 gallons of additional weight. 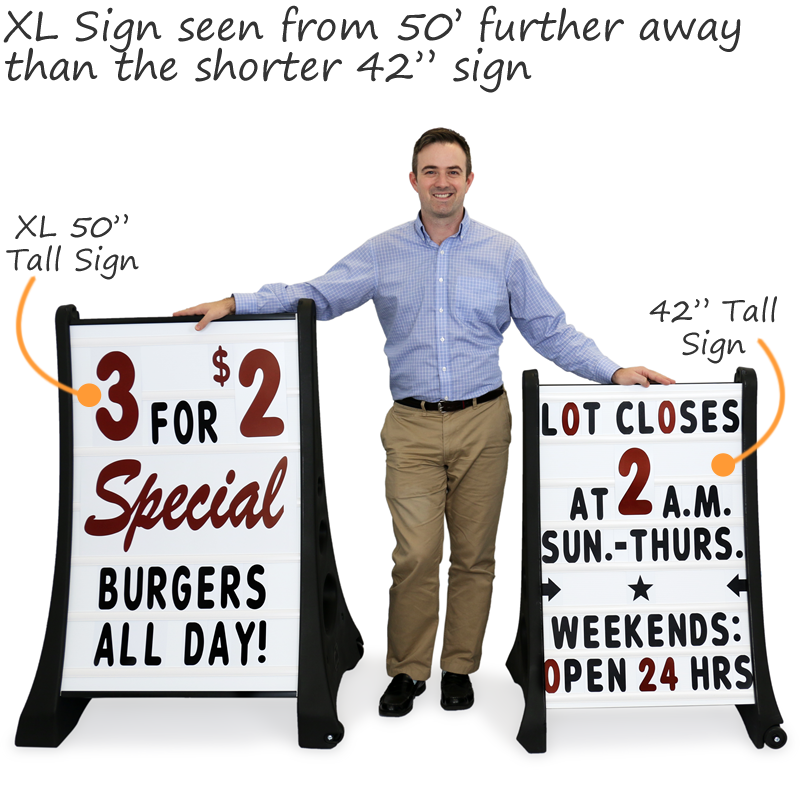 • Converts 34” x 52” QLA™ A-Frame Sign Holder into a 2-sided Message Board sign that displays 7 lines of copy. • Alcoved 3" diameter wheels are suspended above the ground and can be deployed by simply tipping the frame – providing easy transport or maneuverability. 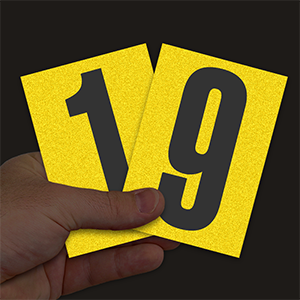 • The STANDARD version comes with two - 28" x 44" x 3/16" (740 x 1150 x 4mm) white message boards with 6 letter tracks on both sides and one set of 289 - 5" letters, numbers, and symbols (black letters & red numbers). 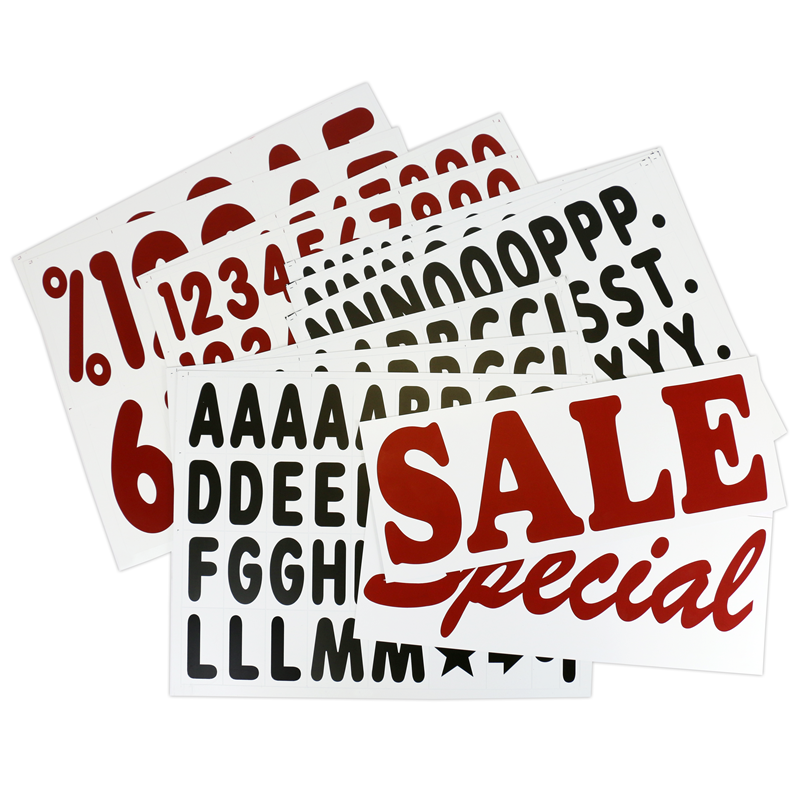 • The DELUXE version comes with one - 28" x 44" x 3/16" (740 x 1150 x 4mm) white message board with 6 letter tracks on both sides, one set of 289 - 5" letters, numbers, and symbols (black letters & red numbers), two giant - 10" double-sided headers (Sale/Special in red), and one set of 24 - giant 10" numbers with the percent symbol (red). 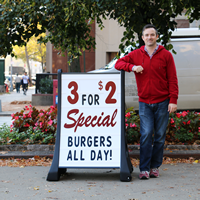 I couldn't find a sign local, so I was forced to by on line and they were fast.